Guaishushu was constantly peeping through my peers blogger’s kitchen, and he saw one women working hard and doing all kinds of baking and cooking adventures to please her 2 lovely daughters and her handsome American husband. 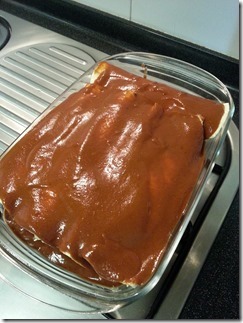 2 days ago, Guaishushu overheard that she told her husband that she wanted to cook him a romantic meal of Cheesy Chicken Enchiladas with Red Mole Sauce for the family this weekend, Guaishushu immediately asked her whether she can teach him this Mexican dish since he is rather ignorant of Western cuisines. 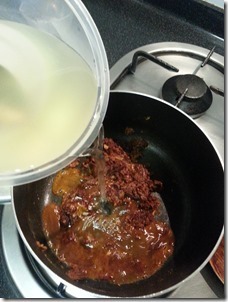 Out of his expectation, this young woman (Ms. Shar Kay) who loves to adventure in her blogger kitchen (http://delishar.blogspot.com) had gladly shared her recipe with Guaishushu’s reader.. In the same boat as Guashushu, Ms. Shar Kay had just started her blogging career in August 2013, 3 month’s later than Guaishushu. However, the cuisines that she designed were amazing and mostly Western Cuisines since her American husband had some “difficulty” of having rice for all the meals. Gusishushu liked to Pin her cuisines on Guaishushu’s international Pinterest Board, what made me jealous is that her pins always attract more repins from Western followers. The conclusion is only one : her recipes are good. 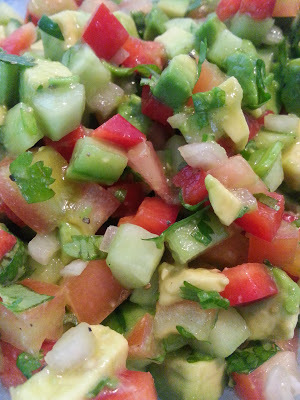 Therefore, Guaishushu had decided to invite Ms. Shar Kay to have a guest post today and I am sure readers will like this special Mexican cuisine posts of hers. When Guaishushu kindly asked if I’d like to contribute a guest post on his blog, I was thrilled and very honoured! He has been an absolute mentor to me from the time I started blogging, which was about 2 months back. Always willing to share tips and tricks on blogging, and cooking. Then I thought this recipe would be a good one to contribute as a guest blogger as it defers from the cuisine and cooking methods that Guaishushu uses. He is pretty traditional, and meticulous in this cooking. Which is pretty much a lost art nowadays, I have to say. What surprises me is that, he is also very open to experimenting new techniques and recipes! Finally someone who can switch back and forth between the old and new school of thoughts when it comes to cooking! These enchiladas are a treat for my family because they are so rich and creamy, not to mention very very yummy. 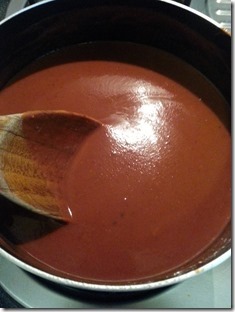 I did not use the commonly used red enchilada sauce as I really like the touch of chocolate used in Mexican cuisine’s mole sauce, so I created one that has a little of both. The spices combined with the slight tartness of the tomato sauce was nicely balanced out by the sweetness and slight bitterness of dark chocolate. And anything with melted cheese or stuffed with cheese is always a winner, and in this case… 2 times a winner! 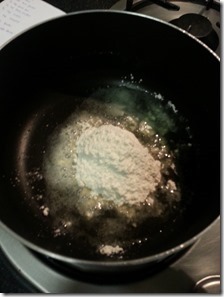 Stir in flour, until you get a runny paste. 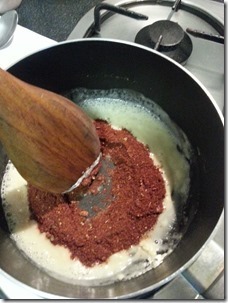 Add spices marked *, and mix well. Slowly whisk in the chicken stock. Until smooth and no clumps found. Then pour in tomato sauce and bring to boil. 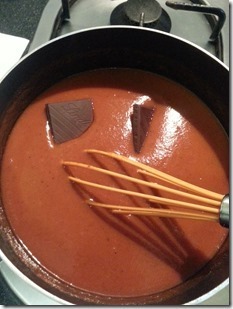 Lower heat and add chocolate. Whisk until dissolved. 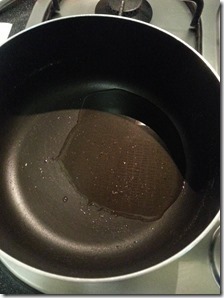 Let the sauce simmer for 5 mins until it thickens. Set aside for later. 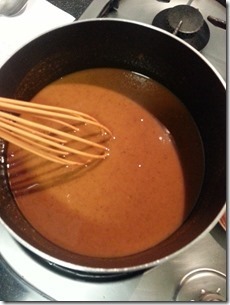 This makes about 4 to 4.5 cups of sauce, I usually make more and freeze it for future use. 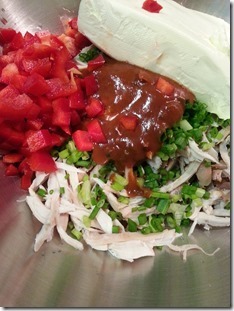 In a large mixing bowl, add cream cheese, chicken, 1/2 cup mole sauce, 2 tbsp spring onion, red pepper, yellow onion. Then mix well. 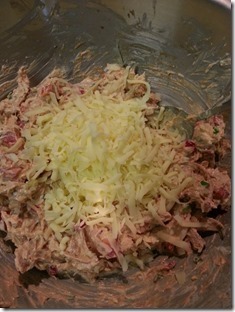 Add about 3/4 cup of shredded cheddar cheese and mix well. 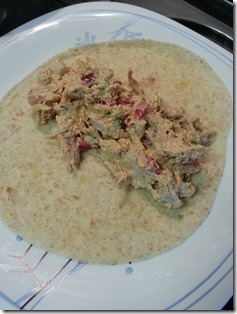 Spoon filling onto tortilla wrap and roll. And place on a 9 x 13 casserole. Continue until casserole is filled. Sprinkle the rest of the shredded cheddar cheese on top. 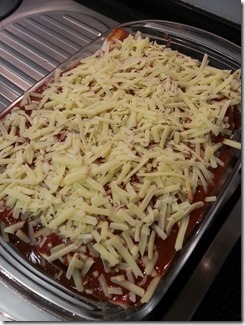 Bake for 25-30 mins on 180C until cheese is melted and sauce bubbly. Garnish with chopped spring onions and serve. Hope you like the post today, cheers. For Four Seasons Blog Hop #24 where I am the Co-host, please join us for the party where you can get a lot of the family related posts. Please click the above logo to enter your post. 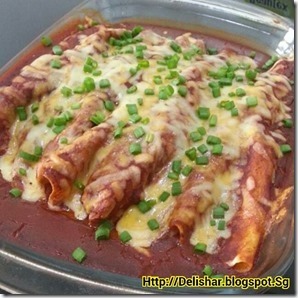 This entry was posted in Dish, Food Preparation Series and tagged cheesy enchiladas, Mexican cheesy enchiladas, mexican enchiladas, red mole sauce, tortillas. Bookmark the permalink. Oh man I love enchiladas! Going to pin this now! 🙂 Thanks for post on the DBB! 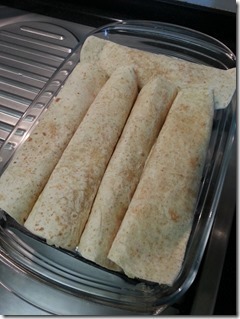 I LOVE enchiladas and these look fantastic. Glad you stepped in and asked for the recipe! Pinning! 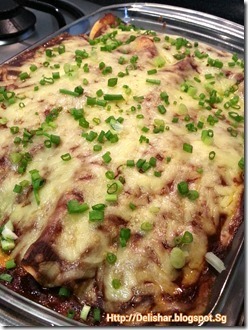 Enchiladas are a fave and these look fabulous!! Thanks for sharing! 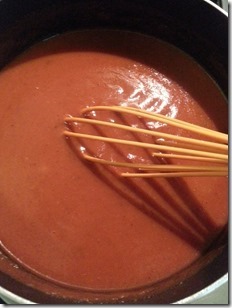 Nora & Kenneth, what a wonderful recipe and I have never made mole sauce – can’t wait to try it! Thank you for sharing on the Four Seasons Blog Hop! I make enchiladas frequently, and really appreciate this recipe! I’ve never used chocolate, and I bet it makes a big difference! Glad you posted at the Pin It Thursday link party. I’ve pinned, liked, twittered and G+-ed your post. I’d love it if you dropped by for a visit at http://www.kneadedcreations.com . I look forward to seeing you over there! Deb @ Kneaded Creations. I love enchiladas, and I love that these have mole on them. Thanks for sharing on Foodie Friends Friday! These look delicious! Do link up your recipes to #tastytuesdays if you like!